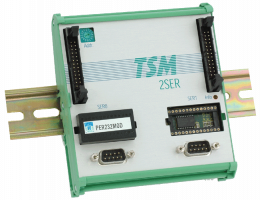 TSM-2SER extends the communication capabilities of TSM to all standard electrical levels. Beside simply expanding the number of channels, TSM-2SER opens the possibility to transfer the burden of message buffering from the master TSM-CPU. The TLCS900 subprocessor accepts fixed length messages or assembles messages checking start and end characters. TSM-2SER can be adapted to most electrical levels by the use of DIL28 modules (special modules on request). 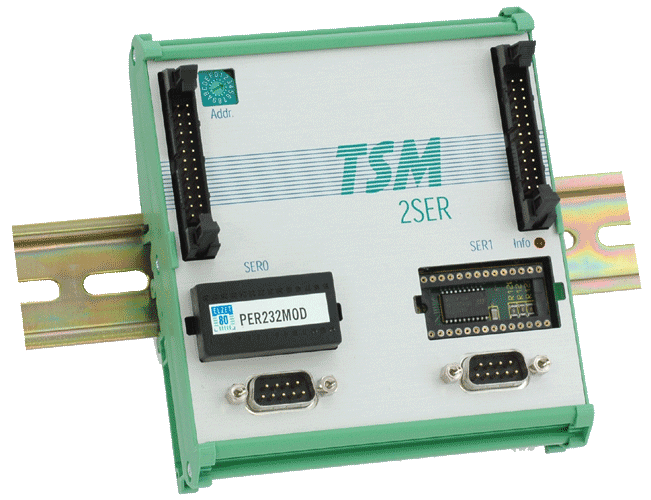 See TSM-2RS232 for a fixed RS232-level version. TSM-2SER comes with firmware in OTP or EPROM to handle all standard asynchronous operations. The API functions allow customization to most asynchronous protocols. For very special applications, the processor can be user programmed, accessing a linear 128K/512K (F)EPROM program area. The large 32K RAM provides ample buffer space. An mCAT real time kernel can be provided for this subprocessor, too, to support C programming. Possible applications are the transparent access of measuring equipment, code readers etc.